Google calls this “zero-shot” translation — shown by the yellow dotted lines in the animation. “To the best of our knowledge, this is the first time this type of transfer learning has worked in machine translation,” the researchers say. What drove this development was the fact that in the last ten years, Google Translate has grown from supporting just a few languages to 103, translating more than 140 billion words every day. That required building and maintaining many different systems to translate between any two languages — incurring significant computational cost. That meant the researchers needed to rethink the technology behind Google Translate. As a result, the Google Brain Team and Google Translate team announced the first step in September: a new system called Google Neural Machine Translation (GNMT), which learns from millions of examples. But the success of the zero-shot translation raised another important question: Is the system learning a common representation in which sentences with the same meaning are represented in similar ways regardless of language — i.e. an “interlingua”? 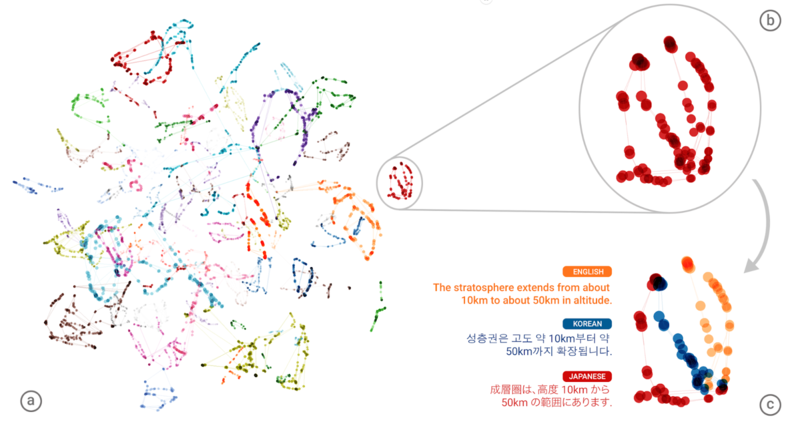 To find out, the researchers used a 3-dimensional representation of internal network data, allowing them to take a peek into the system as it translated a set of sentences between all possible pairs of the Japanese, Korean, and English languages, for example. Part (a) from the figure above shows an overall geometry of these translations. The points in this view are colored by the meaning; a sentence translated from English to Korean with the same meaning as a sentence translated from Japanese to English share the same color. From this view we can see distinct groupings of points, each with their own color. Part (b) zooms in to one of the groups, and the colors in part (c) show the different source languages. The new Multilingual Google Neural Machine Translation system is running in production today for all Google Translate users, according to the researchers.